Great pictures Ronnie! I’m still trying to imagine a fox being able to catch a fish. I thought they ate rodents? Anyway, you must have a lovely property. Great looking koi. All the best. Thanks, Eleanor; I hope they stay great looking and alive! Love these pics! We get a fox every now and then. They are so pretty. But we don’t have any fish at risk, so I can afford to admire. Maybe and maybe not, but I hope you will be back! I hope you’re able to provide protective cover for the koi. It’s likely the fox is just biding his time and plotting on how to score a dandy snack. Good story, Ronnie. Did you take these photos? I love the setting. Just beautiful. Thank you Judy; I am very busy learning camera skills and moving images around the blog. Thanks for the comment about our yard; although we don’t have a huge piece of land it is well landscaped. 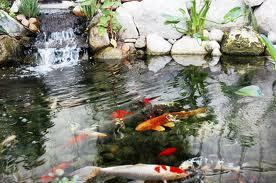 And the pond adds a whole dimension. Please be wrong about the fox returning for a koi snack…it’s terrible to contemplate. They swim around so trustingly and become quite tame when they see us standing nearby. My husband says they can easily be trained to take food right from your hand. I still have a Burl Ives recording of that song! My girls LOVED it when little. 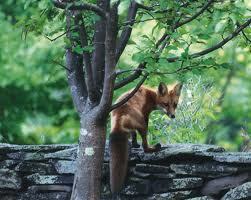 As for that fox, I’ve never seen a fox that fat! It’s obviously learned how to forage in town and get by way better than in the wild! Wow. Good to hear from you, Sue. I know you’re busy with many worthwhile projects; good luck with them. Maybe not, but with Belefonte’s music in the air all sorts of strange people and critters might show up. Glad the koi remain safe under your watch. Thanks; they went to great trouble to get exit visas from Japan to come here, escape nuclear contamination or become meals for suburban foxes. He looks like a sly guy, Ronnie, but my bets are on you for outfoxing that fox! As a former Fox and still a foxy gal, you are the expert on the subject. Ha! Then I’ll get to work! 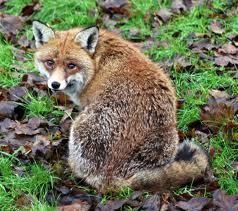 How very rustic…a fox and a pond…loved your description of the foxy experience, Ronnie…a charming read! Thanks, Mal. Are you bothered by foxes in Hawaii?